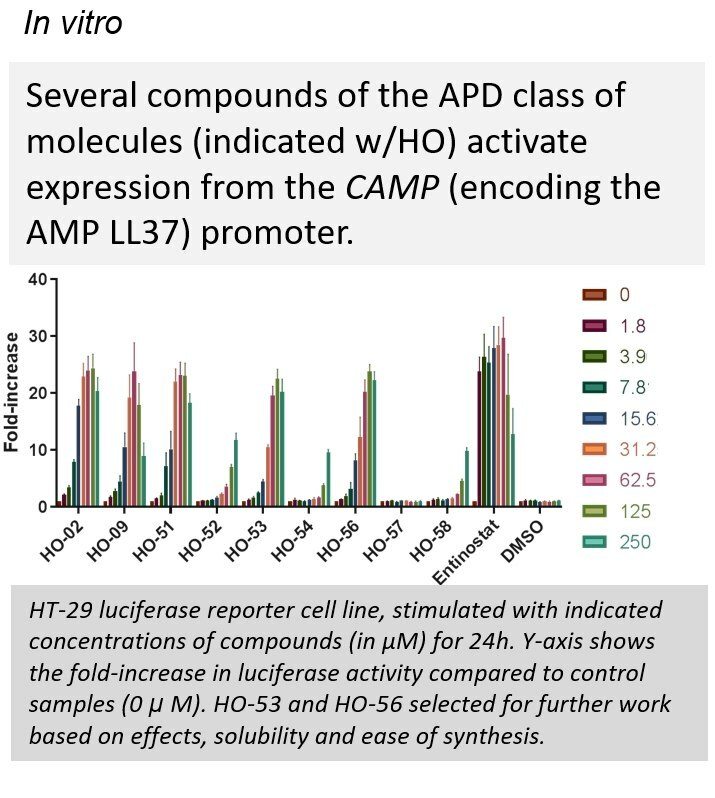 Akthelia has developed and a robust cell-based reporter assay for AMP expression by manipulating the HT-29 colonic epithelial cell line to express LL-37, fused to firefly luciferase, under the influence of endogenous promoters. This reporter assay is a powerful tool for high-throughput screenings. We first employed our assay to screen a panel of histone deacetylase inhibitors and derivatives, and then the entire Prestwick Chemical Library of Food and Drug Administration-approved compounds. After hit confirmation and independent validation in the parental cell line we identified five novel inducers of LL-37. This reporter assay will help to identify novel drug candidates for the treatment and prevention of infections. The Prestwick Chemical Library consists of 1200 small compounds with high chemical and pharmacological diversity. The screening yielded 18 hit compounds; the number of hits as percentage of the library was 1.5%. Only 11 of the initial 18 hits were confirmed in the dose–response analyses. The genomic insert is transcribed into CAMP–luciferase fusion mRNA that is translated into the fusion protein proLL37-Luciferase. From Nylen 2014. Main patent: (WO/2015/063694) ANTIMICROBIAL COMPOUNDS. Matter of composition and use against infections for the Aroylated phenylen diamine class of compounds. International Filing Date:	29.10.2014. National phases in progress US, EU, China.